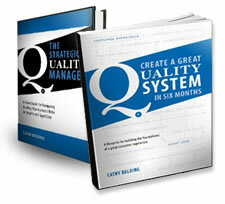 'Create a Great Quality System' is the perfect implementation partner to my first book ‘The Strategic Quality Manager Handbook’. SQM explains the ‘What and Why’; CGQS describes the ‘How To’. Together they provide the framework and information required to build sustainable, effective quality systems and roles that get real results. Purchase the Handbook and Blueprint together for $65.50 - 15% off the total price. Please allow 1-2 weeks for book delivery in Australia and 2-3 weeks for delivery outside Australia. Price for both SQM and CGQS ebooks: $46.50 - 15% off the total price. If you elect to pay via direct deposit, using the bank details on the order page, we will send your email link as soon as we receive notification that the funds have been deposited in the Qualityworks account. Please allow 1-2 business days to receive the ebook link once notification of payment is received.